This Alfa Romeo Workshop Repair Manual is an absolute wealth of information that will help you Maintain and restore your Alfa. Although not a factory manual, the information in this manual will help the home mechanic or professional technician maintain and restore your Alfa with easy to follow descriptions, diagrams and photos. 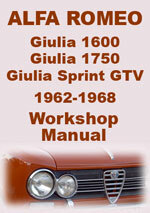 Alfa Romeo Giulia, 1962-1968 Workshop Service Repair Manual $12.99 Immediate Download!